Presumptive GOP nominee Donald J. Trump introduced Indiana Gov. MikeÂ Pence as his choice for vice-president Monday, and Pence delivered a remarkable call for Republican unity. â€œTo every American, who shares our convictions, join us,â€ said the former congressman in the same room in the Midtown Manhattan Hilton hotel whereÂ Ronald W. Reagan launched his own campaign for president in 1979. In a strong, measured voice,Â Pence made his case for Republicans to refocus on the binary choice ahead of the Nation in November. He spoke of values and presented images of his own development with a â€œfront row seat to the American Dreamâ€ and â€œa cornfield in the backyard.â€ Then, in addition to naming members of his family and thanking and praising Trump, the other two name checks were Reagan and the late Associate Justice on the Supreme Court, Antonin Scalia. â€œSeven-and-a-half years of Barack Obama and Hillary Clintonâ€™s policies have weakened Americaâ€™s place in the world and stymied our nationâ€™s economy,â€ he said in a preview of the prosecution of Clinton he will plead for the next four months and a reminder to rogue Republican elements it is time to come in from the cold and stop Obamaâ€™s third term. 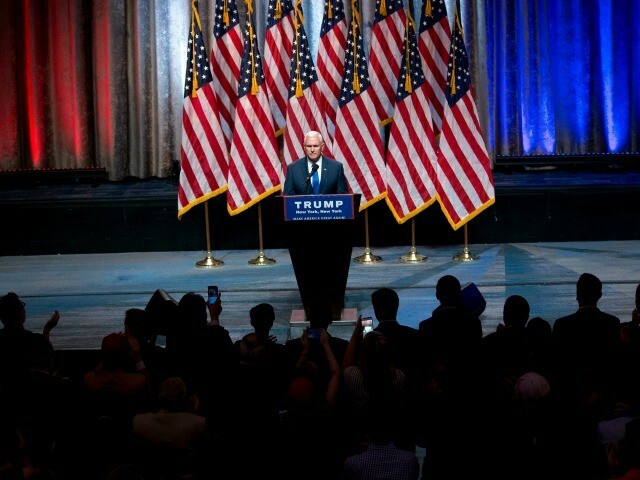 In a litany of examples, Pence set out all of the issues,Â Obamacare, coal, taxes, secure borders,Â where Trump stands with conservatives and what Clinton will do if Republicans do not rally to elect Trump. He was especially specific when it came to what a Supreme Court fashioned with Clinton appointees would do. â€œHillary Clinton will appoint Supreme Court justices, who will legislate from the bench, abandon the sanctity of life and re-write our Second Amendment,â€ he said. Although Pence joined the House GOP leadership at the end of his tenure on Capitol Hill, he was with conservative insurgents fighting leadershipâ€™s constant urge to go-along-to-get-along with Democrats and entrenched power in Washington. Before joining leadership in 2009 as the Chairman of the House Republican Conference, he led the Republican Study Committee, which was then know as the conservative bloc inside the partyâ€™s members. Under Pence, the RSC, which was founded to correct the leftward shift of of the GOP under President Richard Nixon, had a whip operation to hold its members together as a concentrated force. Pence left Congress to run for governor of his home state in 2012, and in his remarks he gave a hint to the frustration with Washington to brought him back home. In the week leading up to the Republican National Convention that starts Monday in Cleveland, remnants of the presidential campaign of Sen. Ted Cruz (R.-Texas), including a man who calls Cruz his best friend Sen. Michael S. Lee (R.-Utah),Â and the leader of the Senate Conservative Fund Ken Cuccinelli, fought inside the partyâ€™s Rules Committee to unbind delegates won by Trump and others in the four months of primaries and caucuses across the country. At the same time, Cruz is shuffling his Senate and Kitchen cabinets to set up for a presidential run in 2020. When Trump mentioned Cruz before introducing Pence, he said the Texan was â€œa good guyâ€; a good guy scheduled to speak at the convention without committing to an endorsement. This made Cruz the man who was not there. It also stood in opposition to the way things were back in the winter, when Cruz refused to criticize Trump, hoping to scoop up his supporters after the New York City developer stumbled out of the race. Back then, Trumpâ€™s own campaign team talked about Cruz joining Trump as VP to forge an unstoppable combination against Hillary Clinton. Instead of Cruz, or anyone else, it is Pence running with Trump, and it is Pence trying to forge an unstoppable combination against Clintonâ€“and making that case to Republicans on the eve of their convention.